A new and practical approach to understanding system theory The modern development of engineering and science requires a deep understanding of the basic concepts of system theory. 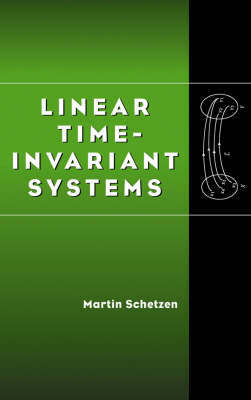 Approaching the subject from a system, rather than an application-oriented perspective, world-renowned system expert Martin Schetzen provides practicing engineers and scientists, as well as students, with a solid, clearly explained foundation in the fundamentals of linear time-invariant (continuous) system theory. Developing linear systems from a functional viewpoint, the book is noteworthy for its presentation of: * The time-domain theory of continuous time linear time-invariant (LTI) systems * System transfer function, gain, and phase-shift * An original development of the Fourier transform, the unilateral and bilateral Laplace transforms, and their inverses from a system theory viewpoint * Basic filter analysis and design techniques from the s-plane viewpoint * Feedback systems and their stability, interconnected systems, and block diagram reduction * The state-variable approach to system analysis and its advantages for certain problems Taking an original, highly useful approach to system theory, Linear Time-Invariant Systems lays a solid foundation for further study of system modeling, control theory, filter theory, discrete system theory, state-variable theory, and other subjects requiring a system viewpoint. An Instructor's Manual presenting detailed solutions to all the problems in the book is available upon request from the Wiley Makerting Department.